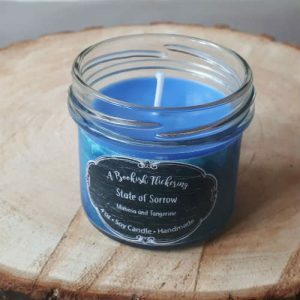 If you’ve been following this blog for a while, you’ll have noticed I love bookish merch, especially candles. 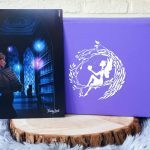 I’ve been a fan of A Bookish Flickering ever since I ordered their very first box back in October, so I was honoured when Manon chose me as a rep for her company in June. 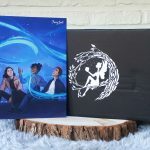 Because real life has been hectic for her, it took a bit longer than usual for the June box to ship, but I received it last week and it was amazing! Disclaimer: As a rep, I received this box for free. However, I always try to be fair in my reviews, so my opinions aren’t influenced by this. So first of all I should probably tell you about the theme for this box. It’s “2018’s Favourite Reads Pt. 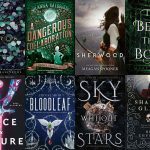 1”, featuring items inspired by Manon’s favourite books of the year so far. Ready to dive in? Okay, here we go! 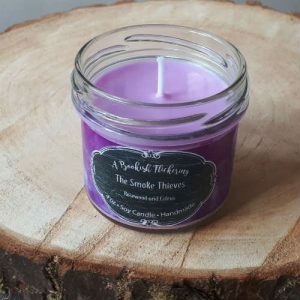 The first candle is The Smoke Thieves, based on the book of the same name by Sally Green (which is currently staring at me from the top of my TBR pile). 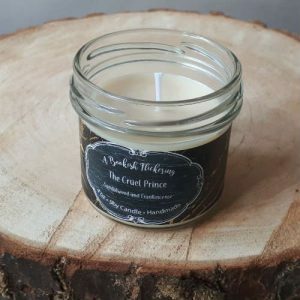 It has a gorgeous pink colour and smells like rosewood and citrus. I mainly smell the rosewood, with a hint of fresh citrus. I’m not a fan of heavy flowery scents, but this rosewood smells divine (it’s probably the slightly woodsy scent). Next up we have State of Sorrow. This book by Melinda Salisbury is one of my favourites of the year, so I was super happy to see this candle. It’s blue and super pretty, just like the book. And the scent? It’s mimosa and tangerine. It reminds me of something, but I can’t quite put my finger on it. Summer vacation in Spain, I’d say, with ripe citrus fruits in the trees. 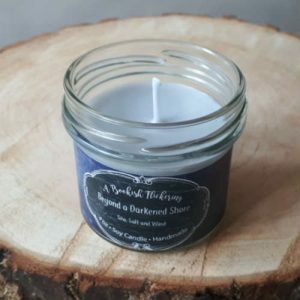 The next candle is inspired by another of my personal favourites, Beyond a Darkened Shore by Jessica Leake. The colour is a pretty basic gray, which matches the book and the scent of the candle really well. The label says it smells like sea, salt and wind. I don’t like the smell of the sea (or at least the one here in Belgium… do all seas smell the same…? ), but this candle smells great, it’s more fresh than I expected! 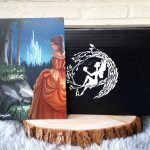 One of the most hyped books of the year was without a doubt The Cruel Prince by Holly Black (which I enjoyed, but didn’t love), so this box wouldn’t be complete without an item inspired by that book. 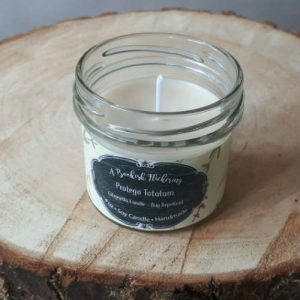 The candle is a very pale yellow, ivory colour and smells like sandalwood and frankincense. My first reaction was “oh, this smells like church”, but the scent also works for old royal palaces I suppose. There was a fifth candle in my package as well, but that was one I ordered separately (so not part of the box!). It’s called Protego Totalum, like the protective spell in the Harry Potter series. It’s a citronella candle, meaning it’s bug repellent. I hate mosquitoes, even though they seem to love me. So I hope I can keep them away with this candle. And can we take a moment to admire the creativity of linking this citronella candle to a protective spell? 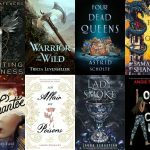 Okay, so back to the actual box now, because we still have some teas to discuss! 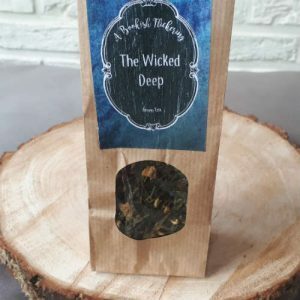 The first tea was The Wicked Deep (inspired by the book of the same name by Shea Ernshaw, which I haven’t read yet). I didn’t find the tea label in my box, so I can’t say for sure what’s in it beyond the fact that it’s green tea. But it smells distinctly like lemon. I would even say candied lemon, because there’s something sugary in there as well, I think. In any case, my boyfriend and I are going to fight over this one, because we both love lemon tea! 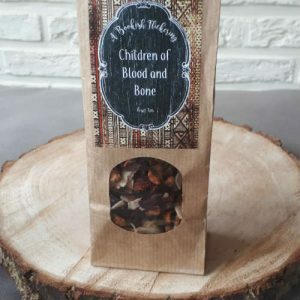 The second tea is Children of Blood and Bone (like the hugely popular book by Tomi Adeyemi, which I haven’t read yet). Again, I can only guess what’s in it, but it’s a fruit tea with raisins or currants, and either apple or pear. There’s more, including something that might be rose petals, but again: I’m not sure. Both teas smell delicious, but unfortunately it’s been 25 degrees and more here for a few weeks, so I’m not really in the mood for hot beverages. 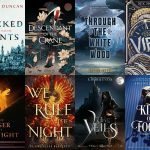 Then again, according to A Bookish Flickering’s owner Manon, these teas are also great as iced teas, so I’ll give that a try this week! That were all the items of last month’s box and once again, it did not disappoint. 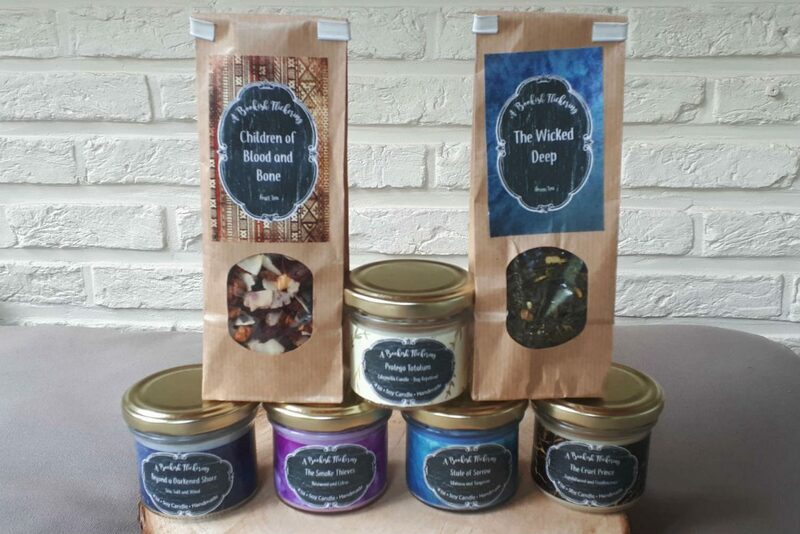 So if you love bookish candles and teas, you should definitely check out A Bookish Flickering.